SAPPHIRE Technology, a leading manufacturer and global supplier of graphics, mainboard and multimedia solutions has just announced a new mainboard developed to support the latest family of CPUs from Intel, the SAPPHIRE Pure Black X79N. The SAPPHIRE Pure Black X79N is a full ATX sized board that supports the latest generation Intel processor family using socket LGA2011. It has 4 DDR3 DIMM slots supporting up to 32GB of quad channel memory, including the latest high speed types. The board is firmly aimed at the enthusiast, with many high end features such as a new SAPPHIRE UEFI BIOS, Dual BIOS switch, status monitor, voltage test pads and thermal monitoring. The multi-channel Digital power management circuitry uses server grade PWM components capable of delivering up to 270W on demand. Hardware monitoring tools and the SAPPHIRE proprietary Mainboard TriXX software allow users to review and adjust a range of system parameters while optimising performance of the CPU. In addition to the core chipset features SAPPHIRE has added extensive expansion and connectivity options. The board has a total of six PCI-Express Gen 2.5 and Gen 3.0 slots all of which have x16 or x8 bandwidth and support CrossFireX technology. 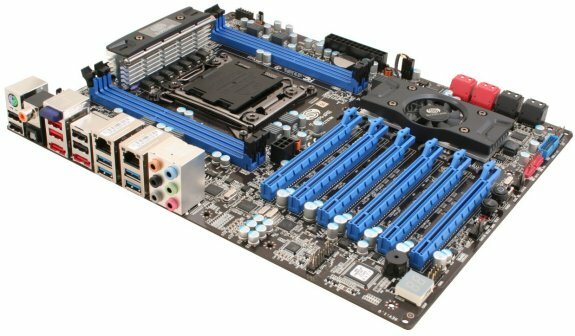 For extreme overclockers, the board has PCI-E jumpers which allow some channels to be disabled. Extensive storage options are provided by a total of four SATA III 6Gb/s and four SATA II 3Gb/s ports as well as two e-SATA ports on the rear panel. I/O support includes a total of 6 USB 3.0 ports (4 on rear panel) and 10 USB2.0 ports (6 on rear panel). Connectivity is provided by two RJ-45 Gigabit LAN ports and Bluetooth with EDR (enhanced data rate) and the board has 8-channel HD audio with Optical SP-DIF out as well as rear and front panel connectors. The SAPHIRE Pure Black X79N will be available globally through SAPPHIRE’s established channel and etail partners.